The Rev. Deacon Alexander Romero, a banker in Santo Domingo and a board member of the Dominican Development Group, giving the status report on the DR diocesan endowment fund to the DDG board members on February 11, 2018. 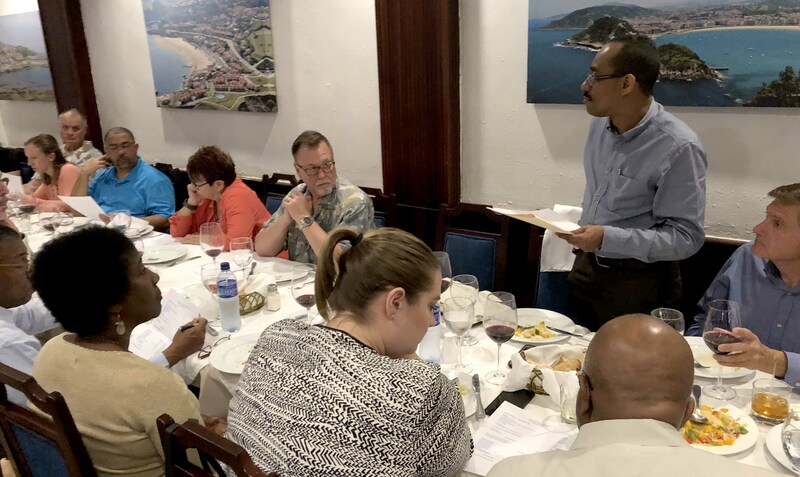 The Episcopal Diocese of the Dominican Republic places a strong emphasis on stewardship and the support that comes from its own institutions such as schools and conference centers. However, those funds are not sufficient to support the diocese’s ministries. With the assistance of the Dominican Development Group, the diocese has established an endowment fund that had a net worth of US$9,681,181 (RD$455,015,490) as of December 31, 2017. In Spanish, that endowment fund is known as El Fondo de Autosuficiencia (FOCA). For a copy of the most recent FOCA accounting statement, click here. Interest from the FOCA funds currently supports 59% of the annual budget of the Diocese of the Dominican Republic. With the support from the Dominican Development Group and mission companions across the United States, coupled with support from The Episcopal Church’s Mark II self-sufficiency grant program, the Episcopal Diocese of the Dominican Republic is projecting that in 2018 it will be capable of self-funding its operations for the first time in its more than 100-year history. This has all been achieved while the diocese has experienced a dramatic growth and expansion of the ministries in communities across the diocese. To make a donation (thank you!) to add additional funds to this foundation account, click here. For more information on supporting this endowment project, please contact the President of the DDG’s Board of Directors, the Rev. Edward Miller [(703) 356-4902 | Emiller@stjohnsmclean.org] or DDG Executive Director Bill Kunkle [(813) 400-2722 | [bkunkle@dominicandevelopmentgroup.org].